This professional firefighter gained the knowledge to not only change his body and health, but also to become a certified personal trainer and step on a competition stage. It all started on January 15, 2015, with an idea. An idea that was so powerful it had enough potential to make me take action. I’m a professional firefighter. That morning was no different than any other day as I woke up and began to get ready for work at the fire department. While I was getting dressed, I realized I was out of breath. I could hardly breathe by simply just trying to put clothes on and tie my shoes. That’s when it hit me, and hit me hard it did. I thought to myself, "How can I get dressed, go to work as a fireman, and help save someone else’s life if I can't save my own?" I was overweight and out of shape, fluctuating from 228 to 250 pounds at my heaviest. That’s not a good position to be in as a fireman, much less for my family. I knew I needed to make a change and make a change quick. First thing I did was go on the "Subway diet," as they call it. I only ate one 12-inch sandwich a day, that's it. Three months went by with me eating this way with no exercise, and I lost 35 pounds. I looked better, my clothes fit better, and friends and family commented and praised me for losing weight and how great I looked. However, I still felt the exact same way as on Day One: out of breath, no energy, and my chest would hurt. I still continued trying to do my job as a fireman and take care of my family, hoping nothing would happen to me. That’s when I decided I needed to exercise. I was afraid to go to a real gym. I had no clue on what to do. So I pieced together some basic equipment – a weight bench and dumbbells – and used what little we had at the firehouse. Every day, I would go to the station and do my workout. With no rhyme or reason, I would start lifting weights and perform exercises in any fashion I thought people did. I started searching the Internet and ran across bodybuilding.com. I found a workout routine called MAX-OT. Still clueless on what to do, I started following that program and it came with a PDF to read about working out. Quickly, I realized my nutrition wasn’t adequate with just one 12-inch Subway sandwich a day. I started eating more foods based on what I would see on bodybuilding.com. I came to the end of the 12-week MAX-OT program and was looking for something to continue with. Over the course of 12 weeks, I had learned a lot from bodybuilding.com and I would see Jim Stoppani’s information a good bit. I saw his Shortcut to Size program and I wanted to do it. I signed up for a membership to the website and joined the JYM Army Facebook group. I would spend countless hours reading everything I could on jimstoppani.com and following all the posts on the JYM Army Facebook page. I quickly learned so much more about nutrition, supplementation, and working out from these two sources, along with every video Jim posted on YouTube, Muscle & Fitness, and Workout 101. I started the Shortcut to Size program and ordered my first JYM supplement – Pre JYM – and I was hooked. I continued Jim’s workouts, program after program, getting better results every time and adding additional JYM products that helped supplement my training. Eventually I found myself using the whole JYM line exclusively. A year had gone by with me following everything Jim would do on the Internet, and I finally felt comfortable and knowledgeable enough to work out in a real gym. I kept seeing the challenges every so often and seeing people getting amazing results. I decided to enter the second Holiday Shred Challenge contest in November 2016. Completing this challenge was the best progress I had made in being consistent with my nutrition and training. The weekly pictures held me accountable. After this challenge, I felt the best I ever had. I would get so many compliments and praise from everyone I knew. The end of this challenge, in January of 2017, marked my two-year journey into fitness. I developed a routine of healthy eating and exercise from the knowledge I obtained through the JYM brand. Friends and family noticed my changes and asked me for advice on how to help them achieve the same results. The first thing I would always do was point everyone I could to jimstoppanni.com and the JYM Army. These two things alone are invaluable and made a tremendous impact on my journey to the healthier person I have become. With the motivation and willingness to succeed I obtained from the JYM brand, I continuously wanted to learn more information about health and fitness with the ultimate goal of competing in a bodybuilding competition one day. In April 2017, I decided to further my knowledge and obtain my personal training certification from the National Academy of Sports Medicine (NASM) to help people who struggle with a healthier lifestyle, just like the JYM brand helped me. Three months later, I received my certificate. The gym I was a member of was looking for a trainer and hired me. Over the course of the last year, I’ve obtained several additional certifications in health and fitness, furthering my knowledge and my career helping so many people along the way. In May 2018, I decided to finally pursue my dream of stepping on stage with the help of Super Shredded 8. I had a vision, a look I wanted so hard to achieve over the last four years, a goal that I knew I had to work tirelessly toward and I ended up doing pretty well for my first completion. 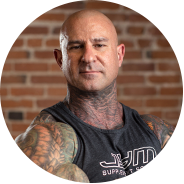 Looking back, I’m extremely grateful I ran across the JYM brand and very thankful for what Dr. Jim Stoppani has done for my life and my family. I will always be a loyal customer because I truly believe in the passion, dedication, and hard work that’s put into the JYM brand to help others achieve a healthier life.